It is incredibly difficult to understate – nigh impossible to overstate – how much influence Carl Barks and his work on Disney Comics has had, in Europe especially where he is venerated to near god-like status. 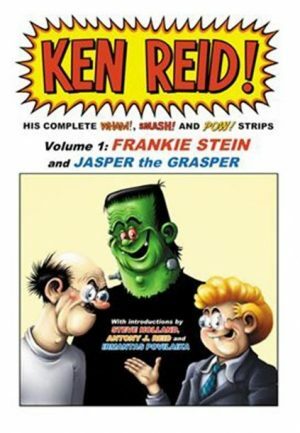 As many have been inspired by Barks, few creators have emulated his style as well as Dutch artist Daan Jippes and the Dane Freddy Milton. So well that Barks praised Jippes’ style and when The Good Duck Artist was asked who he would like to meet during his European tour, Barks named one person: Fred Milton. Jippes and Milton worked primarily as a creative team drawing and writing their own Donald Duck stories. 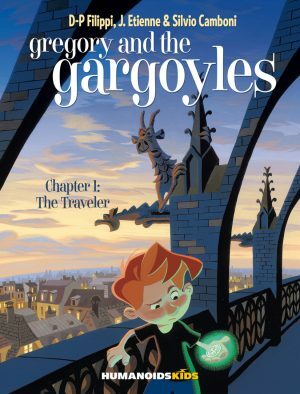 Fantagraphics presents interesting essays on each artist they feature in the Disney Masters series, in this case providing insight on Jippes’ and Milton’s artistic process individually and as a team. Jippes was perhaps best known for his artwork, so good at mimicking the Barks style he was selected to complete twenty of Barks’ unfinished tales. Milton’s illustrative abilities are more unappreciated despite being very good. Compare each man’s solo tales in this book and it is hard to tell them apart, but there are subtle differences. Most notable is that Milton follows the Barks narrative format of tragedy countered by the comical quite closely, something he explains at great length in the closing essay ‘Doing it the Barks Way’. Despite the close resemblance to Barks, there is something very unique to Jippes’ and Milton’s work, modern yet simultaneously retro with a youthful excitement, ‘Disco Ducks’ one example. Both men like to keep their stories short, rarely exceeding 10 pages and both have a fondness for using silhouettes to enhance atmosphere, whether together or solo. Eventually they would set into a creative pattern of how they shared the workload, often with other collaborators like inker Ben Verhagen or writer/artist Robert van der Kroft. Jippes and Milton created with the European market in mind, where Donald Duck stories have long been as popular as indigenous creations. 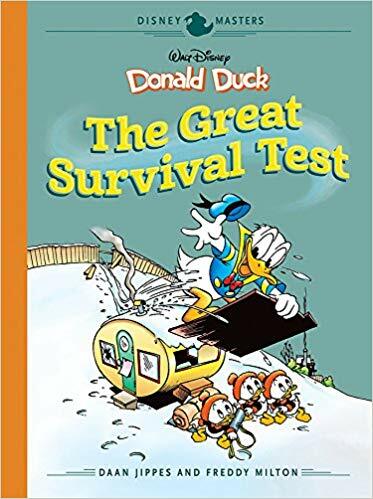 There’s an appreciation for the more obscure characters and there are a number of stories in The Great Survival Test featuring the Junior Woodchucks, Daisy Duck and even Gus Goose. The Jippes/Milton partnership eschewed the mystery adventure format favoured by other Disney creators. 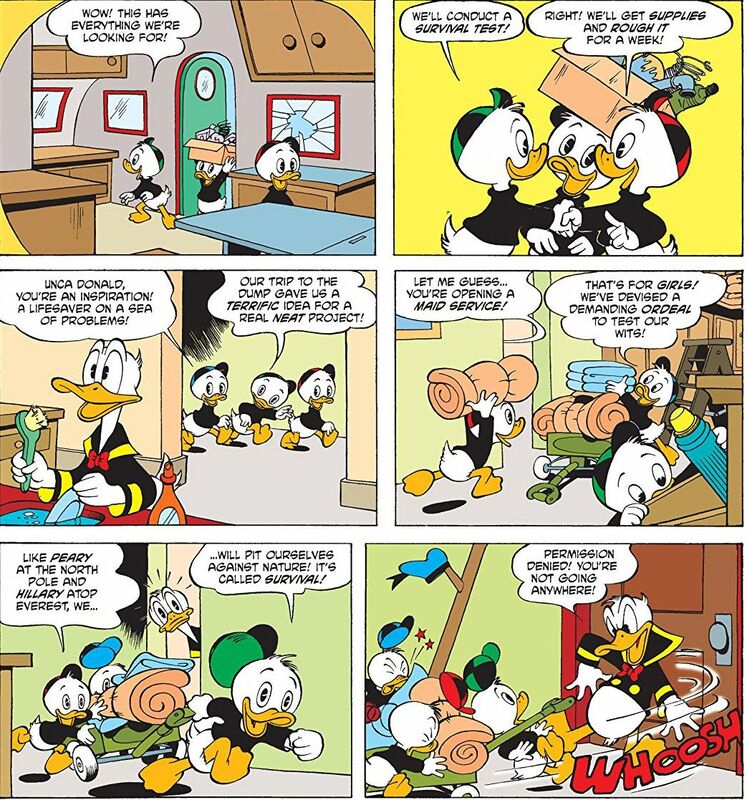 Their tales focus more on occurrences where emotions, usually Donald’s, take sway and, aside from Gladstone Gander getting under his skin, Donald’s worst enemy is himself. It’s human nature at its best and worst, wryly humorous because you can relate to an exceptionally hard worker like Donald getting annoyed at someone like Gladstone who coasts breezily through life. They even subtly comment on prevailing cultural attitudes to poverty and what constitutes real work and success. On the surface the art appears simple but it takes great skill to imbue pictures with this amount of energy and expression, enough to make it seem alive. The Great Survival Test is riotous good fun, full of well crafted stories with plenty of hustle and bustle. 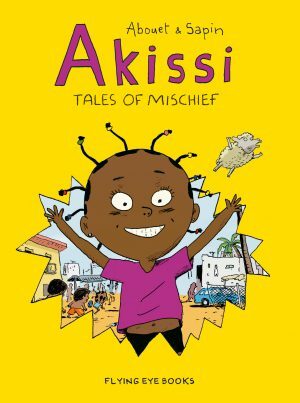 Many of have previously appeared in English, published by Gladstone in the late 1980s. Even used copies of the Gladstone Collection are difficult to come by, so if you have enjoyed these stories before this is a nice and far more accessible format. 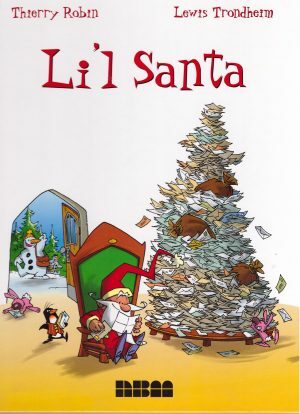 This volume can also be found in the Disney Masters Collectors Box Set 2 and the Disney Masters Donald Duck Gift Set. Fantagraphics fifth Disney Masters volume returns to the work of Italian Mouse Maestro Romano Scarpa in Mickey Mouse: The Phantom Blot’s Double Mystery.